Proper electrical earthing is essential for Cell Sites, BTS Cellular Base Stations, telecommunications or wireless network equipment deployment. Our cell site earthing,telecommunications earthing and communication tower earthing methods closely follow the Motorola R56 standards and IEEE Std 142-1991 and IEEE Std 142-2007 recommended Practice for Grounding of Industrial and Commercial Power Systems guidelines for cell site and telecommunications sites. Nowadays many equipment vendors and telecommunications companies require cell site earthing and telecommunications earthing systems at 5 Ohm resistance to earth. According to the IEEE Std 142-1991 and IEEE Std 142-2007 (The Green Book), the communication tower earthing electrode resistance of large electrical substations should be 1 Ohm resistance or less. For commercial and industrial substations including cell site and telecommunications sites the recommended resistance to earth is 5 Ohms or less. This low resistance is required due to the high potential to earth of the electrical system. Depending upon the site location and soil characteristics, achieving that 5 ohm resistance can be very difficult. With proper soil resistivity testing however, we can provide communication tower earthing solutions that will achive 5 ohm resistance to earth and meet the stringent requirements such as the Motorola R56 standard to keep your valuable equipment within warranty. The experts at E&S Earthing Solutions provide comprehensive cell site earthing and telecommunication earthing solutions for Cell Site earthing or BTS Cellular Base Station earthing. Our cell site earthing and telecommunication tower earthing services protect your valuable equipment! 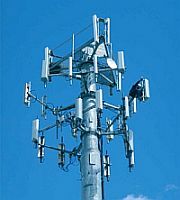 BTS sites (Base Transmitter Station), cell sites, cellular towers and telecommunications centers must provide highly reliable phone and data communications, and in order to maintain this level of service the equipment and earthing must meet NEBS requirements (Networks Element Building Standards). Our electrical earthing solutions compliant with IEEE Std 142-1991 and IEE Std 142-2007 ensure that your high performance equipment is protected.